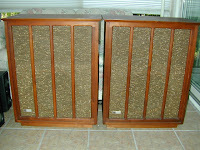 The surprising low value of Fisher speakers produced during the 1980ies is due to the change of corporate ownership. During the 60ies, Fisher Electronics was standing for high quality audio equipment and produced a variety of products that are still recognized as valueable vintage electronics. In the later phase of Fisher Corporation, then a subsidiary of Sanyo Corporation, it produced a series of speakers that have lost most of their former value. 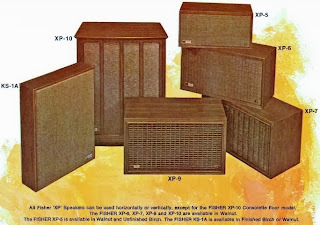 However, with the XP-10, we are going back to 1965, one of those good years, when Fisher offered some impressing, innovative speaker systems. Quoting a forum post I learned one lesson about the various Fisher speakers: “... Prior to this period [80ies], there are some very high-quality speakers, and some very ordinary speakers. The various model numbers don't always tell you everything you need to know, so you can usually rely on the old standard tests: If it's heavy, and it has real walnut veneer, it's worth a try.” With the XP-10 you will instantly feel that it is one of those high-quality speakers when you try to lift it. With 80 lbs. per speaker, it is definitely not a lightweight. The Fisher XP-10 was built during Fisher´s “golden” era. Fisher´s XP-10 was not just the top of the line of the XP-Series in 1965, but is the first speaker incorporating a feature that has become industry standard ever since. William Hecht was working on a soft mock tweeter for display-speakers at audio shows, as the audience frequently damaged the fragile dome tweeters. People touched the tweeters with their fingers and occasionally cracked the thin, rigid material. He found out that his new non-rigid mock dome tweeter was able to produce very high frequencies after being covered with a rubber coating. After patenting the invention, it became industry standard and was licensed quickly by most major manufacturers. The XP-10 became the first speaker with the new soft dome tweeter by Hecht. It was introduced to the market together with the XP-5, adding a bottom and top speaker model to the existing XP series. The price for the XP-10 was a respectable $249.50 in 1965, leaving the other Fisher models far behind. The inexpensive XP-5 started at $49.50 and only the XP-4A speaker in Cherry, Walnut or Mahagony scratched the $200 mark ($199.50). The XP-10 looks significantly different from most other speakers and differentiates itself clearly from the remaining XP models with its three vertical walnut stripes along the front. The walnut veneer is of superb quality and causes the heavy weight of the speaker. The current price for this speaker varies greatly, depending on where you buy it. I have met people at garage sales aiming to make space in their basements, desperately offering them for $40. However, usually you will encounter owners who have spend much money in the past to own a pair of those colossi. A fair price probably lies at around $150, but depending on the condition even $250 can be an O.K. price for a 50 year old speaker and a piece of then-HiFi history. The magazine AUDIO reviewed the XP-10 Consolette and concluded that "the XP-10 is truly a step forward in smoothness, transient response and musical quality. It handled percussion, piano, strings, brass, and what have you, as cleanly and precisely as any speaker system we know. We won´t use that hackneyed term "best", because it is a meaningless term when applied to speakers, but we will say it pleased us immensely. You try it." Keep in mind that the XP-10 is a speaker that has survived more than half a century and will probably need some care when purchased on the used speaker market. Many of them have cracked, rotten foam surrounds which can easily be replaced. A refoaming kit can usually be bought for around $30 and replacing the old foams will take around 1 to 2 hours and is not challenging at all. It does not require any particular skill, just a calm hand and a little patience. We recommend to use a 15 inch Surround Kit from Parts Express, which you can find on the right. Freq. Response: 28 Hz to 28 kHz. Rec. amp. power: 10-60 watts. Woofer: 15" diameter, 18-19 Hz free air resonance, 2" vc, 6 lb magnet. Mid: 8" dia., 1.5" vc, 5.5 lb magnet. Tweeter: 2" soft dome, 2" vc, 5.5 lb magnet, 120 degree dispersion. Crossovers: 200 Hz & 2,500 Hz. Size: 30 1/2" H, 24 3/8" W, 14 3/4" D.
Hello. I found your article very interesting. 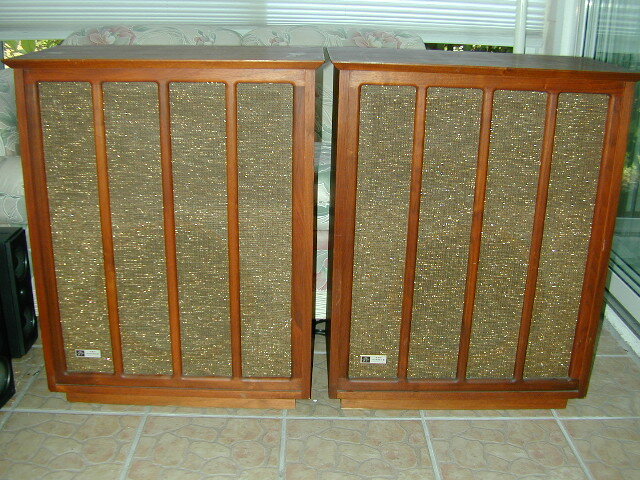 I have a pair of these Fisher XP-10 speakers that my parents purchased new in the mid-sixties. My father worked for Capitol Records and he enjoyed top-of-the-line audio equipment. They are in good condition. I would like to know if you could give me any advice for where I can sell these and get a reasonable price for them. I live in the San Diego area and could travel to Los Angeles or other nearby areas.